Most women hear the word "incontinence" and think, "No, I don't have that!" But urinary incontinence includes any condition in which there is an accidental or unwanted loss of urine – whether it is just a drop, two, or more; whether it happens only occasionally or regularly. Urinary incontinence affects both men and women, however, it is two times as common in women. It is a condition that affects at least 20% percent of women in the United States alone. In fact, some estimates bring this number up to 45% if including women who are undiagnosed. Additionally, approximately 25% of new mothers have unexpected urinary leakage after a vaginal delivery and about 16% of women have leakage following cesarean section. The main symptom of incontinence is the unplanned release of urine; whether it occurs in small drops or a larger volume. This leakage can occur on a daily basis, or may be more infrequent. Most women who "leak" do not identify themselves as incontinent, but should understand that unplanned bladder leakage is not normal and should be addressed early as these issues will not resolve on their own and can worsen. If left untreated, urinary incontinence can affect the way a woman feels about herself and can cause depression or social isolation. In addition, ongoing urinary incontinence can lead to skin irritation and increased risk for urinary tract infections. If you leak a bit when you laugh, cough, sneeze, jog, or lift something heavy, you may have stress incontinence. This is the most common bladder control problem in younger women. If you are often struck by a desperate need to urinate but can't reach the toilet in time, you may have urge incontinence. Some people only have these symptoms during the daytime, while others may only have symptoms at night. Overactive bladder is another name for urge incontinence. If you have leakage when you laugh, cough, run or lift something heavy and have frequent, overwhelming urges to urinate, you may have mixed incontinence. This is a study of the Urinary Bladder. It involves a series of tests that measure the function and pressure in the bladder as well as the flow of urine through the urethra (passage through which urine is passed out of the body). It provides extremely important information on how much urine the bladder can hold, if there is a blockage, if the bladder is overactive, and bladder strength. It can also differentiate between the need for medical or surgical treatment. InTone Can STOP unwanted bladder leakage with no pills, no pain, no surgery, all in the privacy of your home. The InTone device combines pelvic floor training exercises used by therapists with gentle muscle stimulation to ensure success. Voice commands guide you through the entire 12-minute session. You own your InTone and have access to pelvic floor therapy as needed, limiting your chance of symptom relapse. 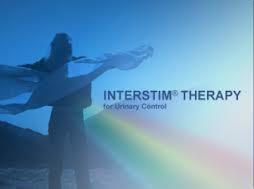 InTone treats incontinence by calming spasms of the bladder muscle using gentle muscle stimulation. InTone has no negative side effects and effectively treats stress, urge, and mixed incontinence. InTone is a solution for incontinence that costs less than pads, pelvic floor therapy or medication. InTone may be reimbursed by insurance companies and has a money back guarantee. Call Dr. Cizmar's office to get further details. InterStim Therapy for Urinary Control treats urinary retention (inability to completely empty the bladder) and the symptoms of overactive bladder, including urinary urge incontinence (leakage) and significant symptoms of urgency-frequency. It should be used after you have tried other treatments such as medications and behavioral therapy and they have not worked, or you could not tolerate them. Call Dr. Cizmar's office for further details. How Much Are Bladder Control Issues Affecting Your Life? 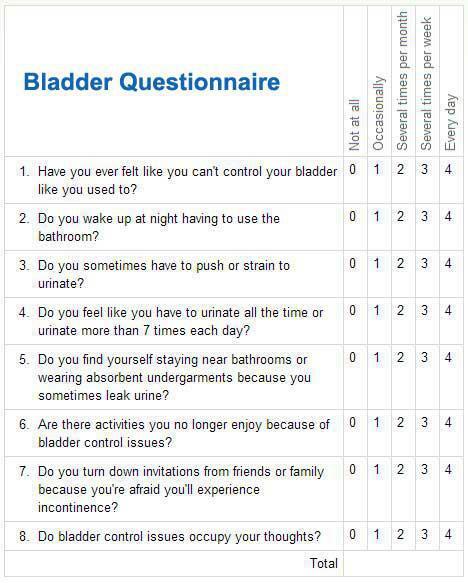 To rate your bladder control symptoms, print this page and circle the number for each question that is closest to what you have recently experienced. When you have finished the survey, add up the points to find out your score. The possible total ranges from 0 to 32 points, with higher scores indicating more severe symptoms. Bring this symptom score to your next doctor visit.